Our staff are more than happy to help you with all the tourist information and we are open 24/7 so there is nothing to worry for late check-in if you are catching a late night flight! We offers hostel and cafe in Khaosan Road area, the heart of Backpacker's area in Bangkok. Located in the great old town which is only 1.5km to Grand Palace, Wat Pho, Chao Phra Ya River and a few steps away from Khaosan Road. Many 7-11s are nearby just few steps away as well as street food stalls. We are sure you won't be starved here! 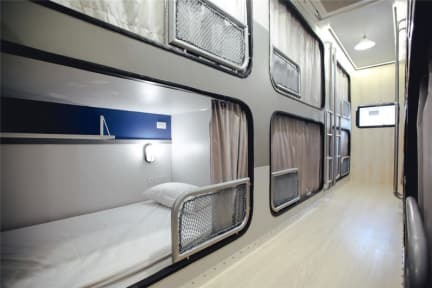 We provide 2 kinds of mixed dormitory to satisfy every backpacker 12-bed standard dormitory and 8-bed premier dormitory and private room for more privacy! It ensures hostel cleanliness by offering cleaned towels, blankets and housekeeping. The guarantee check-in time is at 2pm but we will try our best to let you check in as early as possible. If there is bed available from the night before, you could check in right away, therefore it depends on each day situation. However, we welcome you to store your luggage, take a shower and hang around in our lobby while waiting for check-in. We have 24-hour reception and we never close! However, please inform us your estimated arrival time if you're going to be really late or early morning checked-in. The bed normally will be resold again after 6AM without advanced notice. Please note that any persons under 15 years old cannot be accommodated in this property. If we find out upon checking-in, you will be charge in full price and not allow to stay in our property. Please note that when settling the payment upon the arrival, the hostel accepts cash only in Thai Baht.